Sometimes we don’t necessarily want the inside of our homes to feel…well…so indoorsy. Being inside doesn’t necessarily mean that we want to disconnect from nature and all the life and beauty it can add to our surroundings. You can adorn your walls with graceful designs that capture the grandeur of nature. Our line of Wallpaper Republic designs by Russian-based artist and illustrator Maria Khersonets does just that. She has an amazing talent for harnessing the nostalgic elegance of the natural world. We feature six of her beautiful wallpaper designs on MiltonandKing.com in various colour palettes. From the gorgeous floral trail and vigorous curves of scrolling foliage in Dandelions to the delightfully romantic blend of bold and soft colors in Clover Fields, any home can come alive by bringing the outside in. Governors Rose is an opulent design that features gorgeous bouquets of roses that evoke the sensibilities of a traditional English cottage garden with a dramatic floral motif. While Winsome is more subtle with nestling birds, delicate leaves and a pop of coloured blossoms. A free flowing botanical pattern of linear leaves and delicate bell shaped flowers graces the scene of Snow Drop, providing instant elegance to any interior. Whereas the bold rich colors with soft pastels in Mimosa with berry-like flower heads creates a warm and inviting ambiance that will leave anyone feeling cradled in nature’s splendor. Maria Khersonets’ designs pay homage to the understated glamour and sophistication of English Textile icon, William Morris. She achieves beautiful color combinations, texture and depth. Don’t allow your walls to shut out everything that’s wonderful about the world just outside your door. We can all use a little bit of nature’s touch. Check out all Maria’s designs and the various colour options here and check out our little video below. 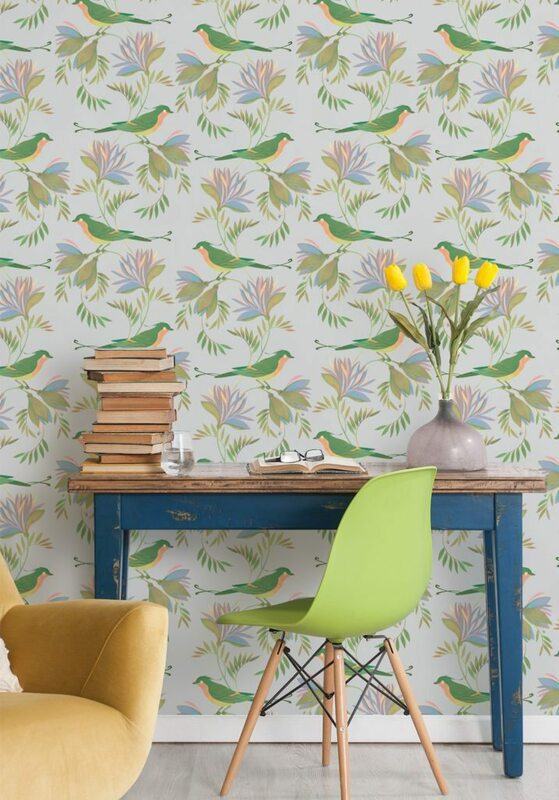 Wallpaper Republic Designs by Maria Khersonets from Milton & King on Vimeo.